The Power Classes series of character archetypes from Mongoose Publishing are designed to be seamlessly slotted into any fantasy-based d20 game. Each of these Power Classes introduces an entirely new core character type, adding a whole new dimension to campaigns. Players will find full details on how to use their new characters, greatly increasing the wealth of options they are presented with by the core rulebooks, while Games Masters will revel in the wide variety of new classes they have at their disposal for Non-Player Characters in their campaigns. 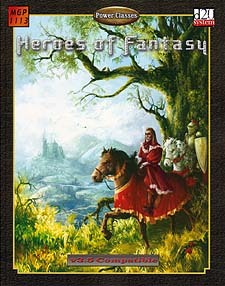 Heroes of Fantasy features an eclectic variety of exciting new character classes. Players can now portray the no-nonsense, money grabbing Mercenary, or the slightly strange, secretive Hedge Wizard. Perhaps being an Exorcist for their favourite deity is more to their liking or indulging a desire to play the Fool. Whatever you want as a roleplayer, Heroes of Fantasy provides a new and exciting way of getting the most out of your hobby!